So you have multiple SCOM Management Servers, yet you just happen to have all of your SCOM agents reporting to one server, or maybe two if you half tried to load balance your agents. There are several reasons why you would want to have multiple Management Servers, ie. off-load workflows, reduce stress on servers, etc., etc. Well what is the point of having multiple Management Servers yet nearly all of your agents are reporting to one, or maybe two at best Management Servers, while the others are collecting dust. 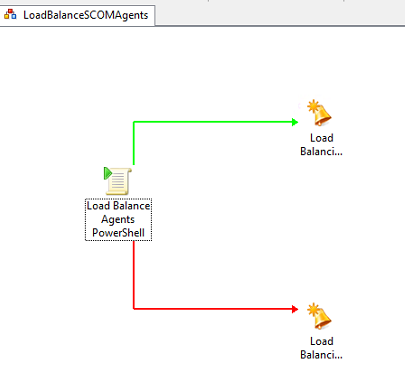 Load balance those agents! You could manually move an agent by right clicking and moving to a new server, or you could let our friend PowerShell automate this for you. In my experience I have seen many SCOM environments where load balancing is either done manually, or not done at all. And usually manually implies the SCOM administrator takes a look which of the servers has the least agents, and deploys away. That works, but why not deploy to any server then let PowerShell load balance for you. In the solution below, I am using PowerShell along with Orchestrator 2012R2. The runbook can be setup to run ad-hoc, or run regularly, ie. monthly, weekly, etc. Of course if you do not Orchestrator deployed in your environment, you could very well take the script and schedule it to run via Windows Scheduled tasks. Here I have created a Runbook to execute the script, and then send back a warning notification if the Runbook failed, or an informational notification that the Runbook executed successfully. See below for the PowerShell script. Please note, you will need to change the Line 5 with a SCOM Management server applicable to your environment, duh. This script can also be modified, and you can load balance between two gateway servers. The script can be found HERE!